Raising Ella Lynn: Happy Birthday to my Dad! Time these days, it flies. So fast that I think I have 6 weeks till Christmas still and all the sudden we are at less than 2 weeks till the big day. My christmas list is still a mile long, the kids are Santa crazy and while one would think work would slow down this time of year, it hasn't. Life is one crazy mess of kids, laundry, work, cookies, therapists and well, I wouldn't change it, but I would like a day to sleep past 6 AM.. Tomorrow is my Dad's birthday. My dad and I have a really strong relationship. He is my sounding board. He will listen (and he never interupts me, he would listen for hours if I made him) and then, he will tell me what he feels. It isn't always what I want to hear and I don't always take his advice (I'm a little strong willed) but I always take what he says and keep it with me. I like to think my dad thinks I am a good kid and is proud of me and what I have done with my life so far. I am pretty lucky to have a dad like him, even though he lives in San Diego and I am here, I know he is a phone call away whenever I need him. 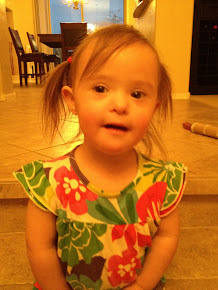 After having Ella, I remember thinking I didn't want to tell my Dad she had Down syndrome. I was so worried he would be sad and I don't like to make my dad sad. He wasn't sad at all. He was on the next plane to Phoenix and pretty darn amazing. He let me cry, he told me all the things he had read. He asked the right questions and held Ella and loved her like any grandpa loves their granddaughter, and since the day he first met my little Ella, she has had him wrapped around her little finger.Happy Birthday Daddy! I love you! Ella had a goal to reach by Christmas. She had to be sitting, not getting into sitting on her own, but when placed into a sitting position, it was important that she be able to stay. Well, Ms. Ella has been sitting since Thanksgiving! Our next goal is crawling or at least getting on her knees and rocking. Have I mentioned that encountering other moms with babies Ella's age is quite the experience these days? They will say things like - "is she crawling" or other totally appropriate questions given her age and I am faced with this dilemma of what to say to them. Normally it is not someone I know, so I don't really think it is appropriate to go into Ella's life history right there at Target, nor do I think I want to catch this poor parent off guard, but I also don't want them to think I am an evil parent who never lets her out of her crib, thus her lack of crawling abilities. I have perfected a smile nod thing and I am thankful I have a 4 year old who normally can't go more than 1 minute without hurting himself, getting lost or breaking something to use as my distraction. It isn't that I mind telling people Ella has Down syndrome, but I don't really want to get into it with the waitress at Outback, so for now, we smile and nod.